Dr. Christina Miller is a family medicine and preventive medicine physician serving on special assignment in southern Africa through World Medical Mission’s Post-Residency Program. A man was brought to our clinic in January with no signs of life. He had no pulse and was not breathing. His friend witnessed him collapse and drove him to our doorstep. Most often in these situations, the man would have been pronounced dead on arrival. Assuming the worst, his friend had already started mourning. 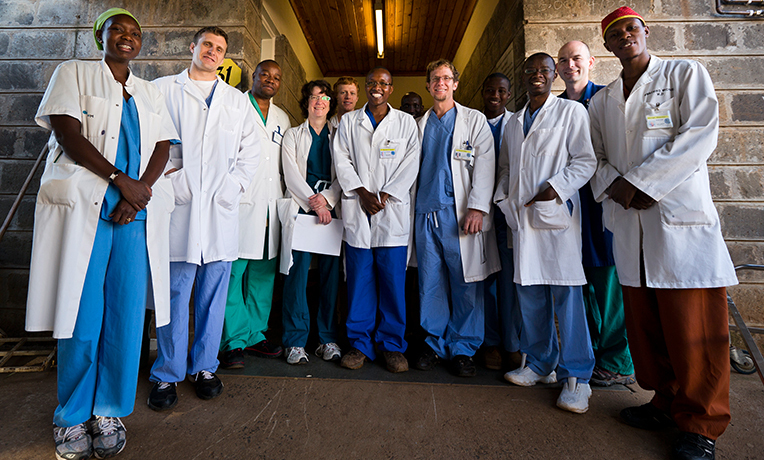 Dr. Christina Miller serves in southern Africa. Half a dozen clinical officers and nurses rushed out to the driveway. They initiated CPR right where the patient laid in the back seat of the car. Our charge nurse wasted no time leading the team during the resuscitation. The clinical officers administered epinephrine doses in the car before the patient was transferred to our treatment room. He received a few shocks of the automatic defibrillator. All of this happened before the doctors arrived. Miracle of miracles, his heart started beating and respirations returned. We transferred him to a government hospital across town that is equipped with an intensive treatment unit. The team there was surprised that CPR had worked to revive this patient. Bringing back patients after attempted resuscitation is so unheard of in this southern African country that even two previous national political leaders have died after collapsing and could not be revived. Yet, this gentleman improved so much that he was released to go home five days later. Dr. Miller and a team of medical volunteers. The week before, a patient newly diagnosed with diabetes had sugar levels that had dramatically fallen from five times above normal to only double the normal levels after treatment. Unfortunately, his vision was still so blurry that he was considered legally blind in both eyes. Neither the ophthalmologist nor I could explain why his eyes were so bad even after his sugar levels improved so much. I doubted that medicine could help him and I prayed for a miracle. I also started him on an additional diabetes medication to try to bring him closer to a normal sugar level. He returned days later and asked me to immediately re-check his eyes. I was hesitant at first, considering the disappointing results the last time he came. I was amazed to find that his vision had improved from worse than 20/200 to better than 20/20. His vision at that point was better than mine. Dr. Miller enjoys caring for babies and children. In less than a month, his sugars had reached optimal control with oral medication. That is something I have never seen in America, or expected, with a newly diagnosed out-of-control diabetic on only two pills. Throughout the month, our team of hearing specialists went to villages on medical outreaches, fitting dozens of individuals with hearing aids. Our clinic staff also screened more than 1,000 children for malaria one weekend in a nearby village and provided free evaluations and treatments for more than 120 of them. I continue to be overwhelmed with joy at my calling in Africa. Where else could I work with a team that is so fully continuing the healing of Jesus? As He said, “The blind see and the lame walk; the lepers are cleansed and the deaf hear; the dead are raised up and the poor have the gospel preached to them” (Matthew 11:5). These have truly been encouraging days where I, my team, and my patients have seen God’s power working to bring healing, and with it hope to so many lives.